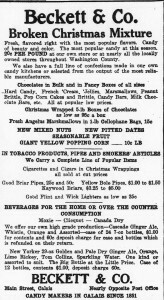 It seems an appropriate time of the year to recall the days when all candy was “local” and Calais was home to the famous candy maker Frank Beckett, Sr. For well over one hundred years to the Beckett family the Christmas season was spent on the third floor of the Beckett building on Main Street in Calais making its famed hard candies for the Christmas trade. 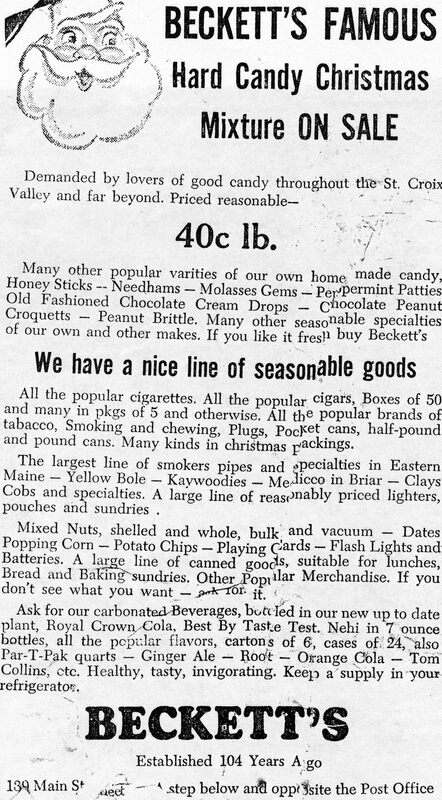 In some years Beckett’s produced nearly 8 tons of Christmas candy. Frank Beckett was born in 1863 and even as a teenager was probably producing ribbon Christmas candy by turning the crank of the “candy crimper” pictured above. The making of ribbon candy was an especially delicate operation and required a good deal of skill but Frank was working in the family business by the age of 13 and had acquired the skills of a candy maker early in life from his father, J.G. Beckett. Frank’s father, J.G. 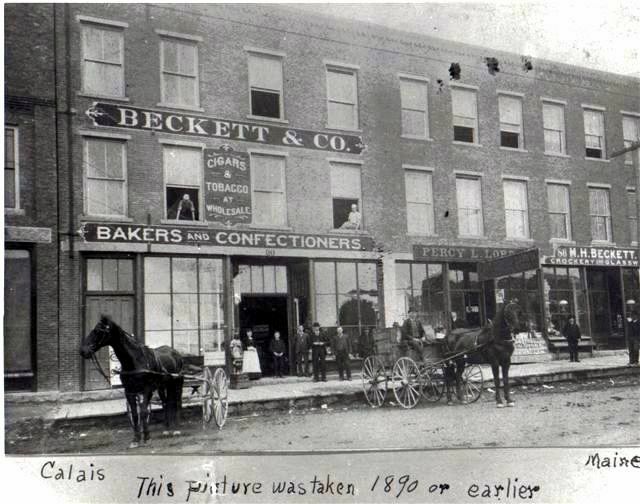 Beckett came to Calais in 1851 from Scotland and opened a fruit, confectionery and candy business on Main Street. 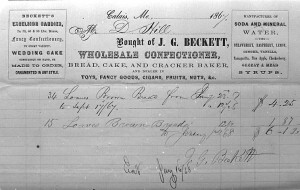 The invoice above is dated 1864 when Beckett’s was situated in a wooden block in which South of the Border is now located. The wooden block burned to the ground in the Great Fire of 1870 and Beckett’s finally located in the building with which most of us are familiar. It is unlikely there is a character in Calais history more interesting than J.G. Beckett . An inveterate risk taker, J.G. went broke more than once and fought with his sons when Frank and his brother blackballed him from the family business out as a result of his “erratic” behavior. After the Civil War J.G. bought few hundred defective Army muskets and sold them for $5.00 each to terrified folks in St, Stephen during the Fenian “invasion”. When he became tired of paying lawyers to battle his adversaries in court he went to Harvard and became a attorney. In the early photo of Beckett’s Store you may have noticed the store of M.H. Beckett to the far right. 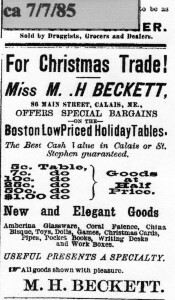 Maude H. Beckett was J.G. 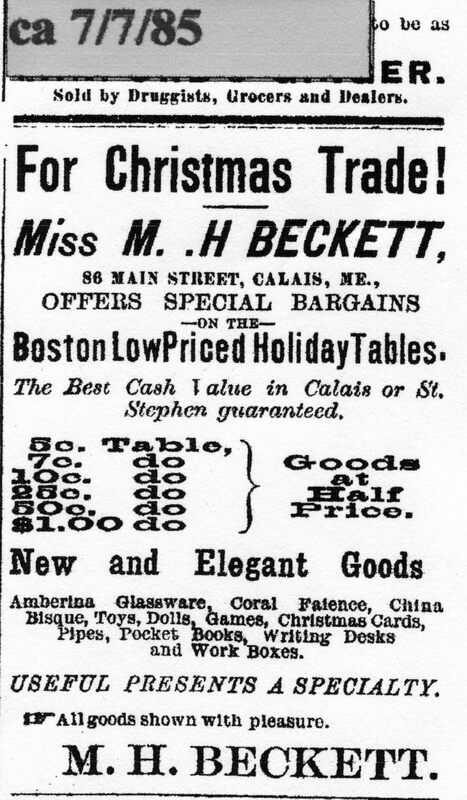 Beckett’s sister and for many years ran a “fancy goods” store just down the block from the Beckett store. 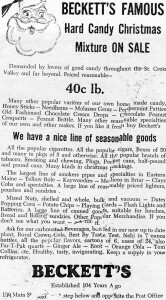 It is likely she also spent time at Christmas either making candy or packing it for shipment as the operation was a family affair from which no one was excused. 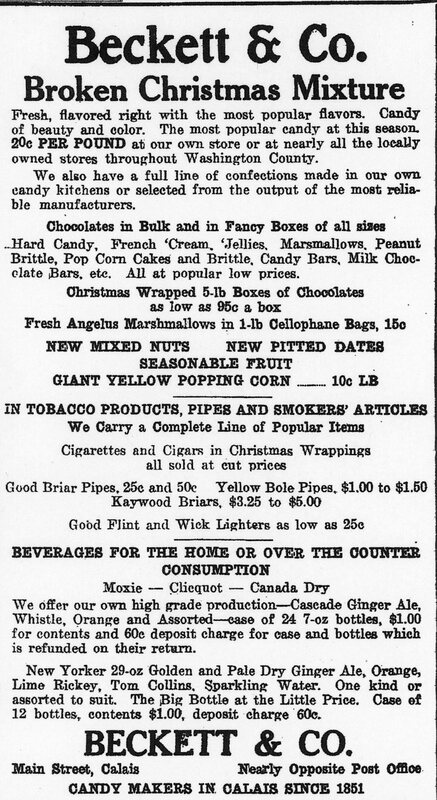 “I went to Beckett’s Candy Store downstreet. 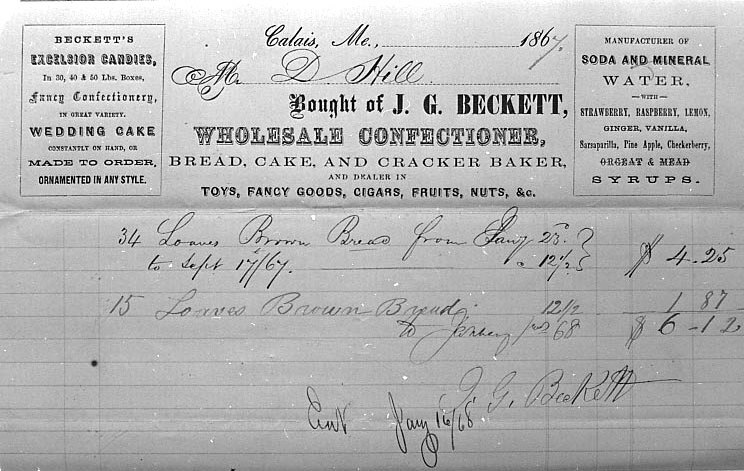 When I was about twelve my mother had a grocery and candy store and bought her sweets from Mr. Beckett. When the order came there was always a special little box for me. 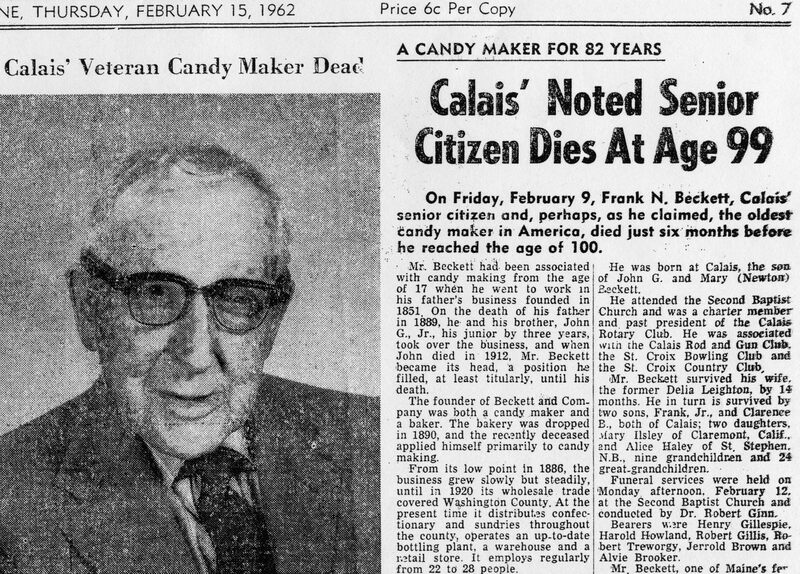 Now Mr. Beckett was retired from his wholesale and retail candy and bakery business, but he kept the candy store, as he said, “to keep me from the rocking chair. I hadn’t seen Mr. Beckett in twenty-five years, but when I asked if he remembered me, he answered, “I surely do, and your lovely mother. I told him my problem. He said, “Well, Mrs. B. would never take strangers into her home, but you go up and tell her I sent you. Nervously I rang the doorbell. When I told Mrs. Beckett who I was and that her husband had sent me, she asked me into a lovely room where we visited. 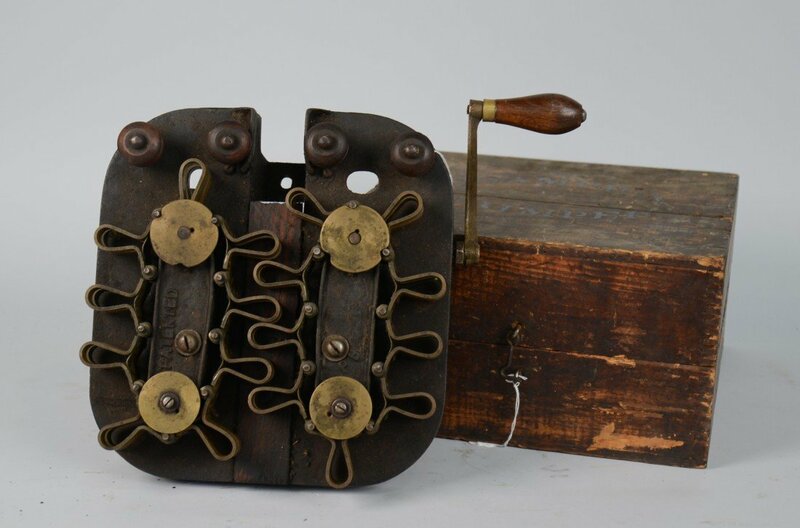 She also remembered my mother and as we talked we found I went to her church, we both liked to make things, and we had other interests in common. 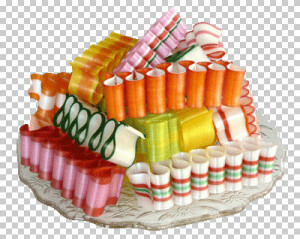 When I excused myself to go, she said, “I’d like to show you my daisy room upstairs.” We went up the stairs to a large room with four large windows draped with ruffled organdy curtains embroidered with daisies. The beautiful brass bed was covered with a yellow daisy bedspread. Two bureaus, a couple of chairs, and a green plush carpet completed the furnishings. After I’d admired the room we went downstairs and I had started to open the street door when she said, “I suppose you’ll be moving in by Thursday? I guess I surprised her when I replied, “You mean, I can come stay in that beautiful, sunshine room?” From that moment we became friends. 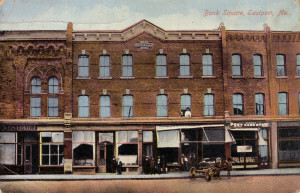 The Becketts remained dear friends until their deaths, long after I had moved to other places. 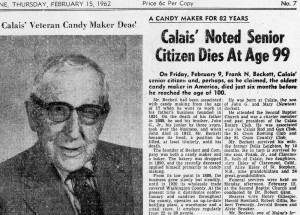 1957, December 19- Associated Press News Release- “Down in Washington, County, Maine, in the middle of the business section of Calais, 95 years old Frank Beckett is finishing the last of his 15,000 pounds of Christmas candy. 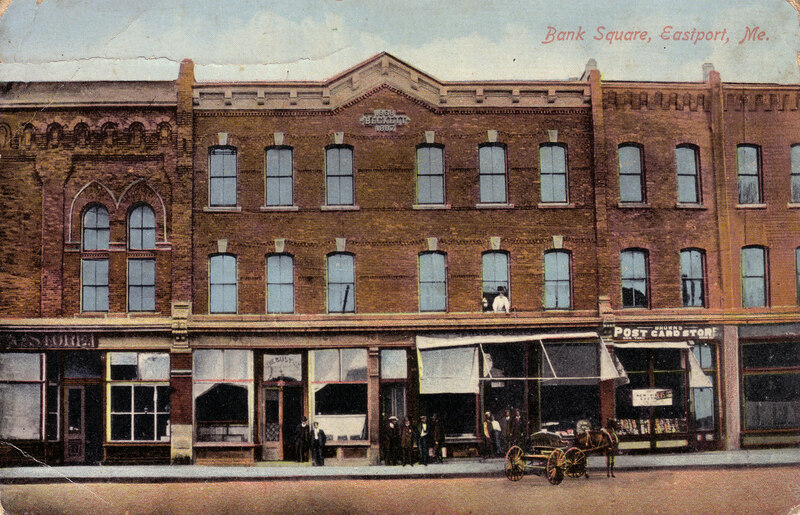 Frank Beckett came within 6 months of reaching the century mark.